Now that you know how-to chop a pineapple. Here are a few reasons why you should buy, chop and eat a fresh delicious yellow pineapple! Pineapple: Super Food. Super Fruit! Pineapples are incredibly healthy. Besides being rich in nutrients like vitamin C, fiber, manganese and copper. Pineapples contain the enzyme bromelain. Bromelain aids in the digestion of protein. Not to be confused with the papaya-enzyme papain, which also aids in digestion. 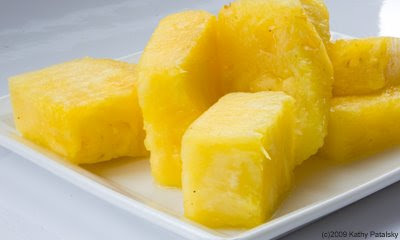 Bromelain is so powerful at breaking down the amino acid protein chains, that it is commonly used as a meat tenderizer. Click ahead for the complete nutrition facts about a serving of fresh pineapple....Stick to fresh. Note that these facts do not apply to canned pineapple. Do a simple taste test and it is obvious that much of the zesty, sweet-tart-tasting bromelain has been lost and much of the vitamin C has oxidized. It is similar to the orange juice rule. Fresh is always best! Pineapples are a great fruit to eat in between meals to improve digestion. 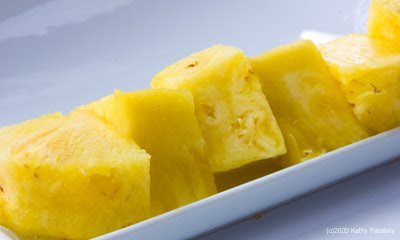 You can also eat a few chunks of fresh pineapple first thing in the morning as a digestive aid. I suggest eating pineapple on a low to empty stomach to get the most bromelain induced effects. You can buy enzymes like bromelain and papain in pill form, but whole fruit sources are always best! Pineapple is also delicious grilled. 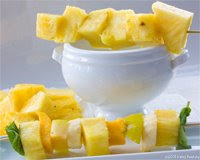 You can even stick chunks on a skewer for a grilled or raw pineapple kabob! Pineapples vary in cost throughout the year. For Hawaiian pineapples, the peak season generally comes in April and May.